Valerie M. Cartwright has stepped down from her position at The Law Offices of Frederick K. Brewington to begin serving her term as Brookhaven Town councilwoman. She replaces Steve Fiore-Rosenfeld, who decided not to seek re-election after serving approximately 10 years as town councilman. 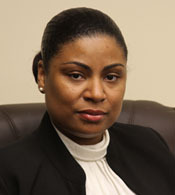 Ms. Cartright is the immediate Past President of the Amistad Long Island Black Bar Association, the former Chairperson of the Civil Rights Committee of the Nassau County Bar Association and the former Chairperson of the Young Lawyers Section (YLS) of the New York State Bar Association. While serving as Chair of the YLS, she published an article in the New York Law Journal, entitled “The Integrity of the American Justice System.” Ms. Cartright is a member of various organizations, which include Zeta Phi Beta Sorority Inc.-Rho Omega Zeta Chapter, Project Hope-The New Direction, National Coalition of 100 Black Women-Suffolk County Chapter, National Bar Association and New York State Bar Association. She is a graduate of Touro College Jacob D. Fuschberg Law Center and West Virginia University. Ms. Cartwright was named as an Alumni Honoree by the Black Law Students Association of Touro Law Center as well as being named the "2008 Public Service Attorney of the Year." She also received the Alumni of the Month award (May 2012) by Touro Law Center for her service to the community. She is admitted to practice before the Courts of the States of New York, New Jersey and Florida; the United States District Court for the Eastern and Southern Districts of New York and the Supreme Court of the United States. Ms. Cartwright was a senior associate at The Law Offices of Frederick K. Brewington, where she concentrated her practice in litigation with a concentration on Civil Rights. She gained expertise in multiple areas of the law including but not limited to personal injury law, family law, criminal law, civil rights law, labor law and employment law. Much of her work was done in the Federal Courts. She distinguished herself as a well prepared and tenacious advocate. "Ms. Cartwright goes with our greatest wishes for all of her future successes," said Frederick K. Brewington, the firm's founder. "While she was here, she championed a number of causes for very worthy and very needy clients. Her work and faithful service now continues as she pursues a public life serving the very fortunate people of Brookhaven Township. She will be missed from our firm, but not from our friendship, as that will continue well into the future."